Join the Boise SheJumps crew for an informational know-before-you-go rafting clinic! At only $20, your ticket includes beer, raffle tickets for amazing prizes donated by local vendors, a SheJumps goodie bag and discounted gear at Cascade River Gear for this night only. 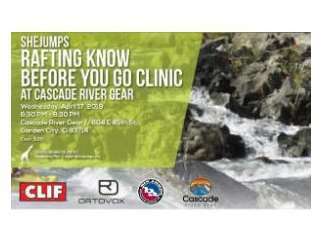 Information sessions will include whitewater safety tips with Zach Mason, owner and guide for H2O Idaho, and a trip planning Q+A with a local river guide. Learn the tricks of the trade from some of the best! A food truck will be on site for this 21+ event. We can't wait for rafting season and to spend the night with all of you!